It’s all too common to begin an auteurist appreciation with an explanation of the old question “What is cinema?” By doing so, the author can curtail their answer to one that expresses what the director in question best represents their conception of cinema: montage and Eisenstein, time and Tarkovsky, “realism” and Swanberg. Thankfully, director Matías Piñeiro doesn’t believe in containing or explaining cinema. For him, the medium cannot be qualified and categorized, and even a director shouldn’t follow any strict conception of what he did before. Cinema can be whatever it wants to be, and Piñeiro’s four films are wonderfully boundless in that sense. 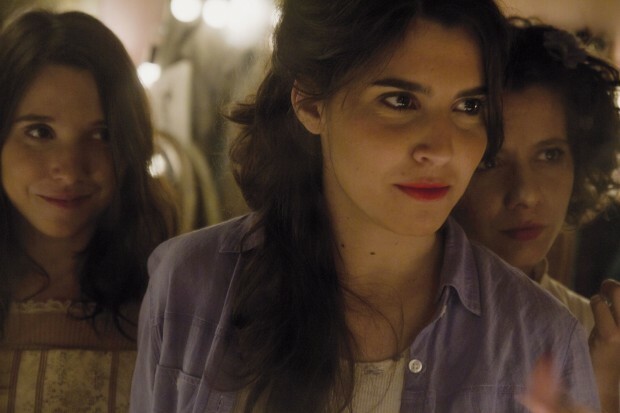 With the theatrical premiere of both Viola and his short film Rosalinda — as well as a mini-retrospective of The Stolen Man and They All Lie at the Film Society of Lincoln Center, as part of Latinbeat 2013 — it is time to acknowledge the Argentinian director is moving world cinema in an exciting new direction. If there is one place to look when finding a history to connect with Piñeiro (a fallacy, but one every cinephile indulges), it would certainly be Jacques Rivette. Like Rivette, Piñeiro is interested in games and mysteries — and not just because Rosalinda ends with a game of Mafia. These games are less about solutions or, even, human truths, but instead about their pace and rhythm. His films are in constant motion, not only in terms of the camera and the actors moving in and out of the frame, but the motivations, locations, and stakes have a kinetic fluidity that is just as volatile. Piñeiro isn’t digressive of narrative, but he is of plot. Like Céline and Julie Go Boating, there’s clearly no answer made by the end of his films — we’re left in more mystery than not — but rarely do they even linger or examine the repercussions of any event. In They All Lie, a family curse is introduced in the first scene, and there is a certain game afoul between the young bohemians, but what, exactly, is the solution — or even a possible one — is never assured, and the ending is more surreal than resolution. Part of Piñeiro’s trick to keep these dynamic rhythms are the very loquacious nature of his films, brought to life by professional actors — notable, as much of world cinema seems to be heading toward casting “real” people. His cast — mostly young 20-something bohemians — understand the art of world play and how to emphasize vowels & linger on consonants to give different physical effects. Using the same troupe in all four films — most notably the seductively playful María Villar — there’s a familiarity with language that is less important to follow the content (there are quite a lot of subtitles) than how language moves bodies and emotions. In Viola, a stand out scene comes as two actresses rehearse a scene from Shakespeare’s Twelfth Night. At some point, they find themselves in a constant loop of the same dialogue, but the relationship between these two women becomes highly fraught with sexual tension. The dialogue transitions to irrelevance to the action on screen, and yet hearing these rhythms is what leads us through the scene. That is not to say one should ignore the content of what these characters discuss, but there’s a playfulness surrounding the text. In The Stolen Man, a character tells another, preparing for an oral defense, to “Make stuff up; don’t learn it by word,” which might as well be Piñeiro’s manifesto. It is curious to see how he uses classic texts as a backdrop for his action, then. In The Stolen Man and They All Lie, it is Facundo by Domingo Faustino Sarmiento, a key 19th-century political text that alluded to then-leader Juan Manuel de Rosas as a barbarous dictator; however, its presence in these narratives is, to an outside viewer, almost apolitical. In The Stolen Man, the text is used by the young bohemians as something to memorize for a test at the museum in which they work. But their interest in the text seems callous at best, so much so that they play a musical game in order to learn the words. There are slightly more unusual plays with text in Rosalinda and Viola, both of which take their names from the female characters who dominate the protagonists of Shakespeare’s comedies (As You Like It and Twelfth Night, respectively). Both involve troupes of actors who are, in some way, both rehearsing and performing these comedies, though it’s less about preparing for a performance than to examine the dynamics within this group. Rosalinda, most curiously, takes place completely outside of a classical performance space, instead on the island of Tigre. The film is almost half-over before we realize that these characters aren’t just rehearsing the play, but seem to be living it in their own strange way. The scenes between Rosalinda and Orlando have genuine passion in them, as she tests him and her love for her (while under disguise), the jungle standing in for the magical realm Shakespeare’s comedies often take place in. Shooting mostly in medium and close-ups, with little editing within scenes, Piñeiro’s films often fill more of an aural space than a visual one. His camera movements glide along the action and the faces, but it’s often what we don’t see onscreen that excites us. They All Lie’s cabin has multiple doors and windows that seem to keep shifting places, which work as both boundaries and where secrets (words or kisses) can be passed. The Stolen Man, shot in grainy 16mm, peppers itself with history — the lovers move around parks and museums and hedge gardens — providing a curious backdrop to a narrative reminiscent of Ophüls’s La Ronde. Offscreen sounds always make up a key space for the director, often creating a new relationship to how we understand these boundaries. They All Lie includes its mysterious telephone, always heard in the background, but never seen; in his Shakespeare films, Piñeiro uses strange and wondrous cuts to forge realities together, or to break our understanding of it entirely (a sunny space outside a car suddenly breaks into an apocalyptic rain storm). And, in one special case in Rosalinda, Piñeiro plays with the digital possibilities of cinema as two women “run out” of a river in a way that I had to watch the film a second time to make sure this moment was as strange and truly delightful as I imagined. As world cinema heads toward films that speak the “truth of existence,” Piñeiro is breaking paths by making films that are so utterly coy and uninterested in finding reality, but instead provoking it. The various lovers in The Stolen Man spend their time forging letters, breaking relationships, and beginning affairs, having a similar route of taking a circular game that leaves the characters more or less where they started. There’s no answer to what this love means, but my notes afterwards had me thinking through its ephemeral and hidden possibilities. A character brings another by a favorite statue in the middle of Buenos Aires. She tells her lover about the history behind it: “Everyone walks by, but only I know.” It’s a fitting moment for Piñeiro’s films, which feel so secretive to those seeing his name in a film festival catalog, but which will strike a deep passion for those who know the immense pleasures his work contains. The Stolen Man, They All Lie, Viola, and Rosalinda begin screening this weekend at NYC’s Lincoln Center. See more details here.